It’s Summer! Yesterday was my birthday and I always consider my birthday to be the sign that Summer is officially here. This is one of the best times of the year because it means swimming, trips to the lake, outdoor barbecues, the 4th of July, parades, everything is so gooooood! 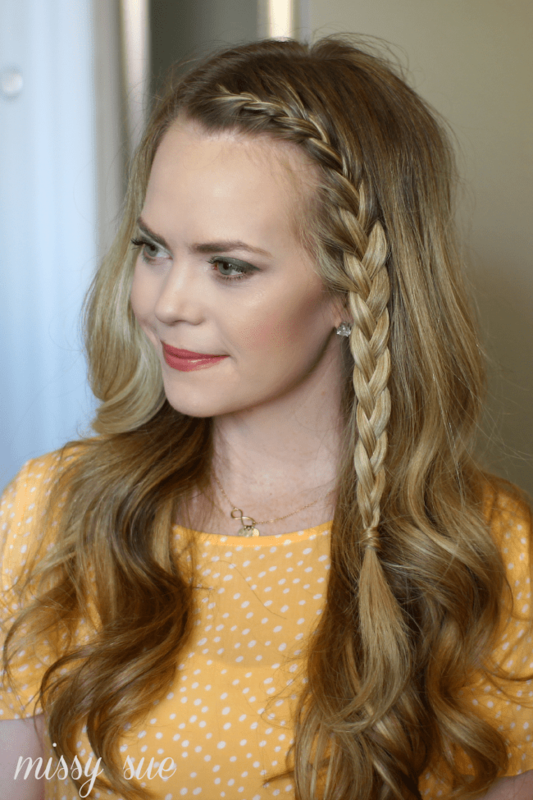 Here’s a quick refresher course on how to French Braid! I hope you enjoy this one though and be sure to tag me on instagram or twitter if you recreate this look! Love ya! Step 2 / Brush through the hair to remove any tangles. Step 3 / Divide off a front section of hair by creating a vertical part from the original part down to the left ear. Clip off the back section to keep it out of the way. 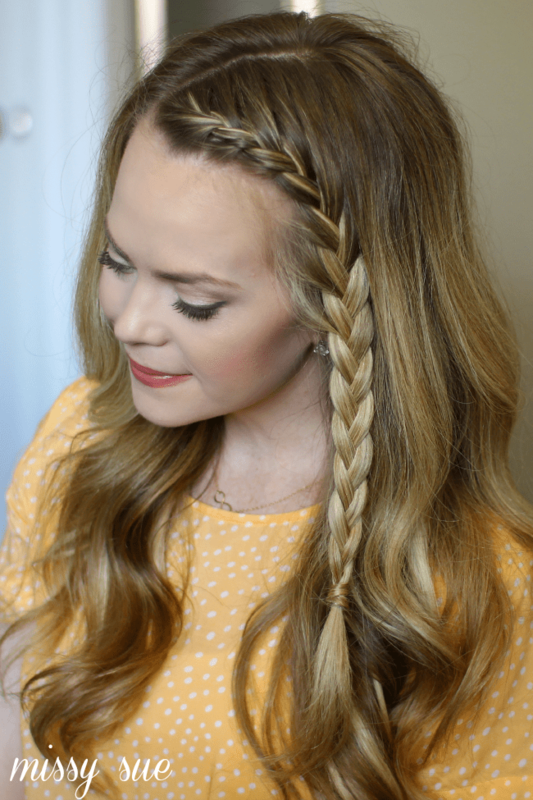 Step 4 / Pick up a small, 1″, section of hair on the left side of the part for the braid. Step 5 / Divide this section into three equal pieces. Step 6 / Cross the back strand over the middle. Step 7 / Then cross the front strand over the middle. Step 8 / Cross the back strand over the middle and bring in a section of hair incorporating it into the braid. Step 9 / Now cross the front strand and bring in another section. Step 10 / Continue french braiding the hair down incorporating hair into the braid until it’s all brought in. Step 11 / Braid the rest of this section down into a regular braid. Step 12 / Tie off the end with an elastic band. 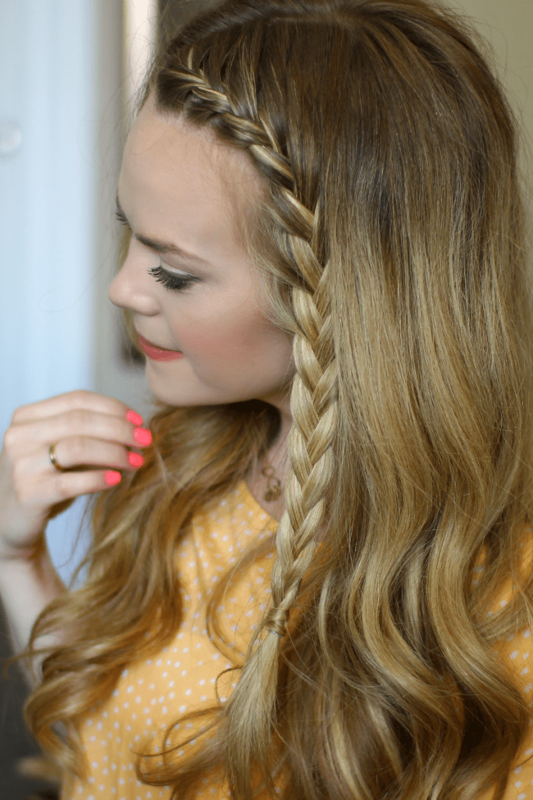 Step 13 / Curl the ends of the hair with a 1 1/4″ curling iron. Step 14 / Mist the style with a flexible hold hairspray and you are ready to go! I’ve been practising the braid but even though I braid from the part, there tends to be a gap between the part and where the braid begins. Do you know why? I absolutely love your tutorials! But I was wondering how you get your braids to be so clean and defined. Is it just your hair, or du you have any tricks to tame flyaways and fuzziness? It looks like you wrapped hair around the elastic at the end- how do you hold it there?